Gold prices closed higher last week, confirming the previous week’s closing price reversal bottom. The market was driven higher by a drop in U.S. Treasury yields. This morning, however, Gold prices are sliding back slightly as Brexit optimism triggered profit-booking of the yellow metal. But doubts concerning the US-China trade deal and global growth are helping recover the losses as prices are back above the $1300 level. 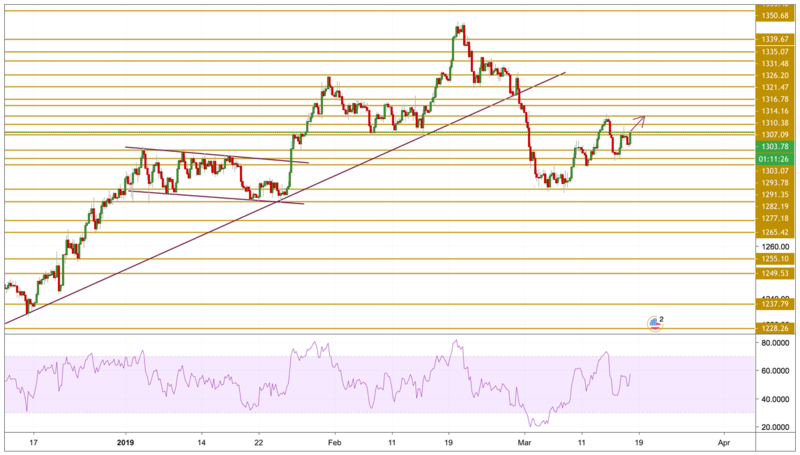 Gold prices are still trading around the $1300 level as near support and resistance levels are playing well their part. The price is currently trading just below the $1304 level after it picked up some momentum this morning. It will face next the $1307.09 resistance level if the upward move is to continue and that will be the level we will be focusing on before shifting towards the $1310.38 level.